In anticipation of his upcoming conference presentation, Deep Learning in Cloud Based Applications at Predictive Analytics World Chicago, June 20-23, 2016, we asked Tanay Chowdhury, Associate Data Scientist at Zurich North America, a few questions about his work in predictive analytics. A: They predict different things from predicting risk to hire a contractor, predict crop yield, to how well a software is performing given its telemetry data. A: It helps immensely in building better, customer oriented software’s. The decision to include new feature in an existing piece of software basing on user experience in related features is one such instance. A: My predictive model to predict crop yield in economic perspective helped save the organization approximately 20 million per year compared to the existing model, as the new model was better considering weather variables. A: Neural network is better in predicting huge fluctuation in output compared to Random Forrest or GBM, and necessarily in such cases ensembling is of little help. A: It will give emphasis on current state of operation on cloud based deep learning implementation challenges and different outlooks related to that. 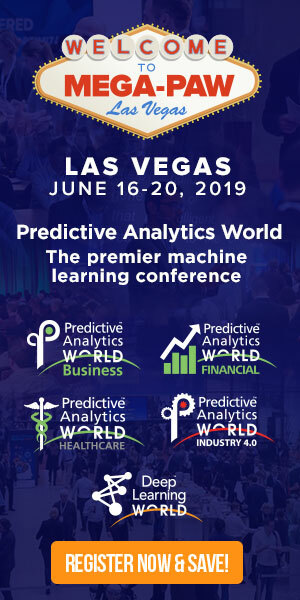 Don’t miss Tanay’s conference presentation, Deep Learning in Cloud Based Applications on Tuesday, June 21, 2016 from 4:20 to 4:40 pm at Predictive Analytics World Chicago. Click here to register to attend. USE CODE PATIMES16 for 15% off current prices (excludes workshops).